We had 6 inches (15 cm) of heavy, wet snow Thursday night through about Friday noon. Yesterday was about 45F (7C) and today it is 58F (14C) which means most of the fresh snow has melted. It’s time to get started in the garden! 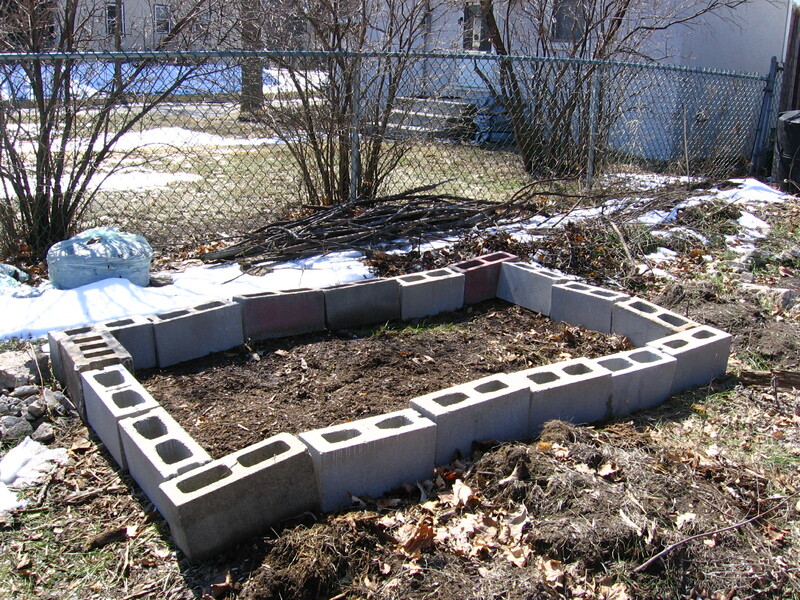 Today Bookman and I made a trip to Home Depot and bought ourselves new garden gloves and cinder blocks for our raised polyculture bed. Oh, and seed starting mix for starting a few things in our mini greenhouse in a week or two. We put down the blocks for the bed and obviously have some leveling to do, but it is a start. In this bed will go a lettuce seed mix, spinach, radish, beets, dill and parsnips. As the early veggies get pulled they will be replaced by purple cabbage, broccoli and beans. The bed will get filled in with soil and compost and seeded over Easter weekend in two weeks. So excited! here anyway and I didn’t give it any winter protection. And I can’t tell whether the lemon balm and sorrel made it. 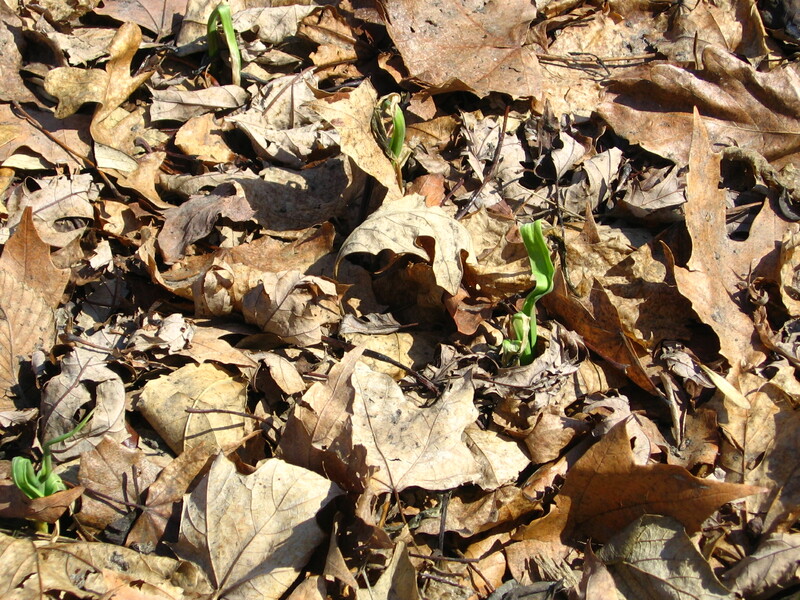 They die back to the ground and nothing has sprouted yet but it is early. And I was so relieved to see the garlic I planted in the fall that sprouted because it got warm again before winter set in appears to have made it through as well. When I was buying seeds earlier this year I also bought a big bag of white clover seed. Clover is a green mulch. It fixes nitrogen in the soil and it shades the ground keeping weeds from growing. When it dies back, you just leave it where it is so it continues to act as mulch but also as in-place composting. I have never done this before but that is how it is supposed to work. I broadcast a bunch of the seed in my front garden beneath my apple trees this afternoon. Most of the grass beneath the trees is gone because the trees shade it out and because for the last two or three years we haven’t raked up any leaves in the fall. Last year we had a bit of rust on the leaves and even though we don’t have any junipers nearby (junipers are host plants for rust), I read that it can also overwinter in the tree leaves and one should rake them all up in the fall. So we did. And I greatly regret it. I regret it because in the process of raking up all the leaves we eliminated a lovely layer of mulch and overwintering home for beneficial insects like spiders. It also left the ground bare so who knows what sort of weed problem we might end up with this year. After a few years of letting the leaves compost in place, the soil is dark and rich and lovely and because we cleaned up the leaves from the fall, nothing will be added to it this year. I feel like I ruined a nice little ecosystem, an ecosystem that, in hindsight, might have been able to take care of any of the rust fungus, keeping it from coming back. The clover will help as a temporary replacement for all the leaves, I hope. The sap is running in my maple tree. I saw a squirrel scratch at a branch and then start licking up the sweet sap. Something, I don’t know what, has actually bored a small hole in the tree about 15 feet up and there is a small trickle of sap dripping out. Bookman and I each caught a few drips and tasted it ourselves. It was good! We are considering tapping the tree next spring and trying our hand at making syrup. We’ll see. Earlier in the week the Friends School Plant Sale catalog arrived in my mailbox. I rushed through it like a thirsty person in the desert who just found a watery oasis. Oh I’ll plant this and this and this, and oh my gosh, that sounds nice too and I definitely need one of these and I have no idea where I could plant that but wouldn’t it be great to have one? Today Bookman and I started going through it together beginning with herbs and vegetables. Bookman ran out of steam when we got to the two-page spread of heirloom tomatoes. The sale isn’t until May 9th so next weekend we will pick up where we left off. It is so nice to be in the garden again even if it is still too early to do much. A few more weeks though and I will be despairing about how much there is to do. I can hardly wait! Love hearing about your gardening adventures. I can HEAR your excitement in your written word! Helen, it has been such a long winter! I am hoping we get a nice spring before rushing into summer. booksandbuttons, thanks! I like to name all my trees and shrubs but Jan and Joel came pre-named as those are their variety names. I love them though and don’t think I could have done better! BookerTalk, clover might help with the ivy but ivy is pretty aggressive so you will still have plenty of chopping back and digging out to do. It felt so good to be outside moving around! Sadly, there is no easy fix in this case. Does it help to know that I have been battling creeping charlie in my garden for years and still haven’t won? Glad you’re beginning another season of gardening. We’ve just beginning to have some real nice weather. Forecast of over 10C next week, but there’s still snow on the ground. I’ve also started birding. All the best for a successful gardening season! Arti, it’s been such a long winter it is so nice to finally be able to do things outside even if what I can do in the garden is still limited. So glad nice weather is making its way to you. The birds have been busy here. We even had a bald eagle fly over the house about two weeks ago. We see them by the lakes sometimes but have never seen one fly over so that was a nice surprise. I am looking forward to all your birding posts! This year is the first in which I’m cognizant of the ecosystem and beneficial insects and such. I’m sure over the years I’ve haphazardly done rotten things to the yard and garden. I hope I can make up for past mistakes and provide our native friends a comfortable habitat. Vanessa, it is exciting, isn’t it? I am glad you liked the photos. I wanted to put kale in the polyculture bed too but I am afraid it will already be quite full. In my head a 4×8 foot bed sounded so huge but in reality it isn’t as big as I imagined. I hope you and your husband work out the pumpkin v Brussels disagreement! Bookman loves gardening but he isn’t so great at the planning so I get to say where everything gets planted 🙂 I am sure I have done lots of rotten things in the garden in the past too and probably will again but we learn and do better the next year! I like your raised cinder block bed. I might copy that idea. I guess you can actually plant in the little holes as well and have things spilling over the top? I got outside last weekend and got very little accomplished other than trim the growth from around the patio. I didn’t want to drag the edger out and get the extension cord, so I used what you’d probably use as an ice chopper thing. Good exercise. Then I put down some garden fabric in the beds. When I raked up all the leaves on the patio I found lovely red wigglers! It’s time to get the plants into the ground out here. In another month it will be way too late. In fact, I should have planted a couple of weeks ago. Well, looking forward to your progress reports! Very cute wellies! I wish I had an excuse to buy some! 😉 This surely must be the sign that spring is near–you are finally working in your garden! Danielle, thanks! It was nice to keep my feet dry while standing in puddles, snow, and soggy grass and mud. I don’t know why I waited so long to get some. You know you can get a pair and call them rain boots. Keep your feet dry when walking to the bus! It is so nice to finally be able to get out into the garden. It’s been a long winter, I’m rested and ready to go! I’m so pleased and impressed that your trees have come through that terrible winter of yours. 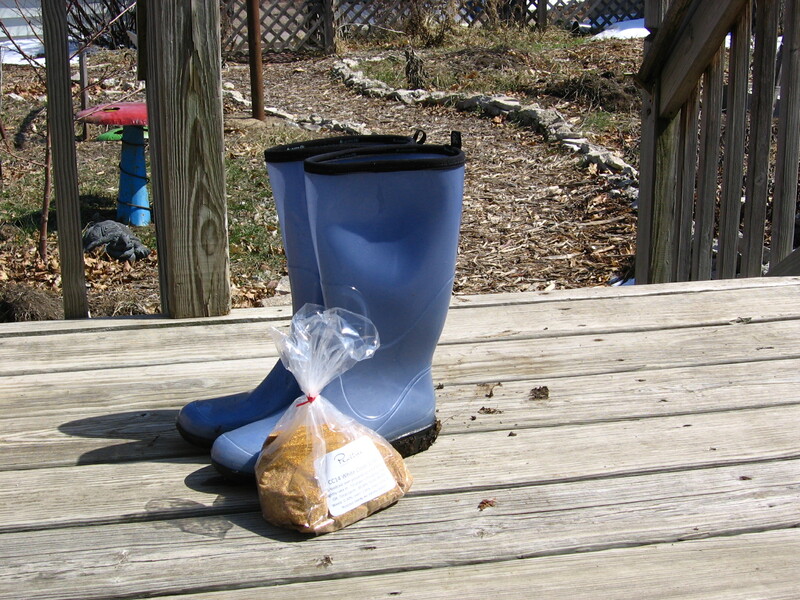 What crazy weather you have – 70 F just a few days after you had snow!